SoCalCycling.com Team Clothing is Available for Purchase Through July 12th - SoCalCycling.com - Southern California, Cycling, Cycling News, Amgen Tour of California, Bicycle Racing, Fun Rides, Cycling Event Schedules, Mountain Biking, Cyclocross, Cycling Photos, Cycling Videos, Interviews, Product Reviews. We are currently taking pre orders for anyone that would like to order a SoCalCycling.com jersey, bib shorts and Tech T-Shirt through this Friday, July 12th. 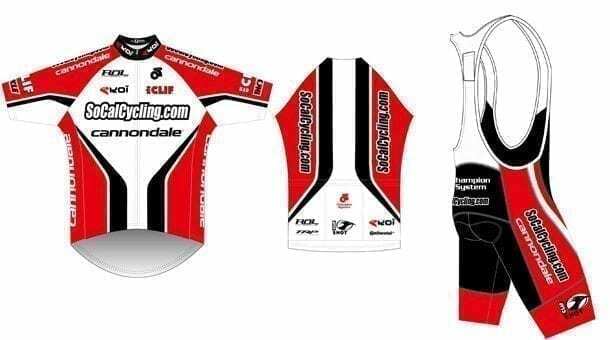 The kit is comprised of custom high quality Custom AirLite Jersey and Custom CS Razor Bib Shorts by Champion System that look and feel great. The SoCalCycling.com Team has been racing in the kit this season and loves the high quality, fit and performance of the Custom AirLite Jersey and Custom CS Razor Bib Shorts. Read SoCalCycling.com’s product review for more information on the Custom AirLite Jersey and Custom CS Razor Bib Shorts. We would love to have you sporting our kit! The deadline to order is by July 12th and the clothing should be available in early to mid September.